“I’ll meet ya’ at Borrego Springs…Partner!” he said with a drawl so deep that the end of the sentence arrived with the beginning. Then he turned around and walked through the wall, carefully stepping over road apples and the fireplace before fading into the distance, with his horse. Being shaken awake by the ghost of Robert Mitchum was a small price to pay for a full day of canyon carving, testing, moto-modeling and indulging in general hooliganism on the ’04 Yamaha YZF-R1. Add to that; hanging with Jamie James, Doug Polen, the guys from the Internet R1 Forum plus the Yamaha crew, and it could have been the spirit of Zorro or the Federales armed with their badges for all I stinking cared! The unbridled pleasure of riding the bigger better smoother faster version of the already flawless R1 (not to mention being passed on the inside by Doug Polen, in the fog, with him moving so fast that my paint wrinkled!) was an experience worth far more than a full night’s sleep. Days earlier and diagonally across the continent, I was lamenting the grayish, aging snow that was residing on the roofs of Nyack. This winter brought waves of it with too few days of respite above the melting point. Slice into any snow bank and you could read the winter’s history, each thaw creating a crispy layer just in time for the next storm. I haven’t enjoyed a clear path from my garage to the street since Thanksgiving. Not exactly the harbinger of riding weather. I’d finally surrendered, admitting that the damn groundhog was right when the rescue call came from Yamaha. Before you could say “El-Kabong!” my lizard-skin boots and I were at the Hertz counter in San Diego pointing at the red Mustang convertible. Flying to San Diego was a cakewalk compared to the ninety miles of traffic and intermittent torrential rain that I coerced that car through. Why do all Californian drivers turn into studio starlets in the rain? While the wind whipped the convertible’s top until it quivered like a surplus Boy Scout tent I coaxed the car up the mountain eventually leaving the freeway as the weather eased. We drove by outer-world landscapes, mounds of large white boulders abandoned millennia ago by heaving movements in the earth’s crust were framed by charred remnants of groves and estates lost in the recent fires. The rains came too late. I cautiously drove through the haunting mountain pass and deep into the Borrego Valley. My destination was the desert oasis of La Casa Del Zorro. As what little light there was faded, I found myself pondering the irony of circumstance; I was driving on road that began as an emigrants trail where thousands died leading their families, livestock and all possessions to a better life. 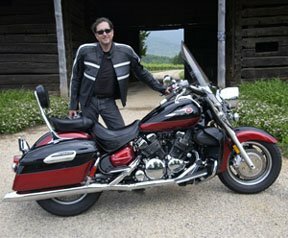 “But is it?” I asked myself, while enjoying a car named after a horse, whose vitals are controlled by computers, searching the spectrum of Satellite radio, on a mission taking me to ride the latest in high tech motorcycles. Measured against the bizarre landscape I felt suspended in a strange dimension between the “The Matrix and Stagecoach”. Then I found the adult comedy station and all was well. Borrego Springs sits high in a desert mountain pass smack in the middle of the Anza-Borrego Desert State Park. One of the largest parks in the west boasting 600,000 acres of canyons, badlands and sand dunes yet only five or six actual paved roads. As opposed to La Casa Del Zorro, which is an oasis centered on that said plain with all the 21st Century amenities you and I would want and those early settlers couldn’t imagine. My poltergeist left behind a damp gray morning but La Casa Del Zorro’s hot breakfast and Yamaha’s fast company, which included the aforementioned hooligans and “Ileen the Umbrella Girl” more than made up for some lost sleep. I picked a red rocket to match my leathers and was shortly warming my tires with some fellow riders behind Photographer Tom Rile’s rental car. The masters of weather and light favored us for the photo session and then it was off on a mission to terrorize the twisties in time to meet the others for lunch at a place called Mother’s. 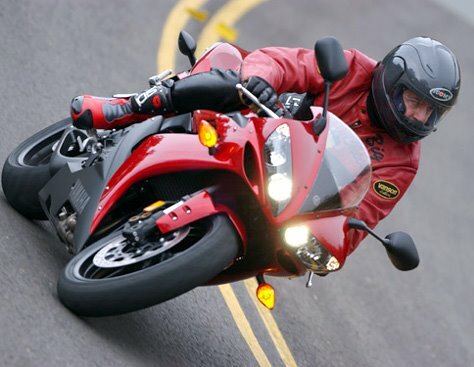 Back in 1998 Yamaha set the sport-bike world on its ear with the trend-setting YZF-R1, and for 2004 they’ve set the R1’s engine on its proverbial ear, allowing the frame to go above the heads as opposed to around them, giving the rider two more inches and no, its not the two inches that your daily dose of spam promises. With Spam as the furthest thing from my mind I rode the bike into Mothers’ lot in line with her sisters. It had been a few hours of Alpine-style riding, both in texture and temperature and I was ready to sit by a warm fire. The row of Ones and boisterous banter emanating from inside the restaurant indicated that we’d wandered up the correct pass. Mothers’ chef did a very Californian-style vege-burger with beans and cheese and for once I remembered to ask ‘le Chef’ to nix the Thousand Island dressing. What is it with these California and Thousand Island dressing on burgers? I’ve heard rumor that in the 1950s there was a statewide ketchup shortage. Politicians urged drive-in and luncheonette owners to come up with a new burger-friendly condiment because too many out of work carhops and soda jerks would cause collapse of the entire southwest economy. Meanwhile the Mexicans refused to sell the gringos the secret of salsa, which actually tasted good on burgers. Things looked bleak until a blonde carhop, fond of Thousand Island on her salad decided to add the salad to the top of her burger in order to save time eating and the rest is history. East coast burger fans traveling west be warned that now, with Arnold and Maria, who are as mayonnaise a couple as you could get, posing as California’s First Family there’s no hope for a burger without that poisonous pink spread. Unless you demand it, loudly! Prior to lunch I had the chance to grab an ’03 One for a few kilometers and instantly noticed the difference. Comfort zone is first to mind; bars are higher by 10mm, pegs lower by 7.5mm and a bit more forward 2.5mm, not large numbers but the proof is in the riding. According to Yamaha’s media materials, the frame’s redesign increased its rigidity by 200% vertically and 50% sideways. I’ve learned a wee bit about motorcycle riders and motorcycle physics on this job and can’t envision any situation where a 200% increase in rigidity would be unwelcome. Cheers to Yamaha. The stiffer chassis plus a front geometry change of increased rake and offset increased the One’s flick-ability tremendously but it’s the throttle response where I found nirvana. The One has a new fuel injection system that uses a motor-driven secondary valve controlled by a new 32-bit computer system. This puppy hums and rolls smooth from stop to the 13,750rpm redline! My vote for best improvement is for the computer and new throttle bodies but the lighter crankshaft and pistons deserve a bit of the credit. Yamaha’s also hot on their new Fracture Split con-rod caps, which provide a more precise fit over the bearings. Cracking the bottom of the connecting rod provides a rough surface like the nooks ‘n crannies on a fork-split muffin, creating two halves that mate perfectly with increased rigidity. Need I repeat my philosophy of rigidity? The engineers are also proud of the new sleeveless cylinder design, which allowed the cylinders to operate in closer quarters and shaves nearly an inch from the camshaft. All of these improvements are crammed into a crankcase 56mm smaller than last year’s. While all the above creates the smoothest power-plant this side of the Grand-Prix circuit, the power needs to reach the wheel and the One does it with a new transmission that is the the smoothest shifting gearbox mechanically possible. When you’ve would her up to the redline and see the bubble gum machine cresting the horizon you’ll scrape the speed off quicker than ever by pumping Dot 4 from the larger (14mm to 16mm diameter) Brembo radial master cylinder into redesigned calipers that grab a 22mm larger 320mm rotor who’s also dieted off a half mm in thickness during the last model year. I spent the better part of the daylight hours riding the desert plains and passes, much less time in the saddle than it would take to list the 400+ improvements; LED tail-light, titanium exhaust, 5-spoke wheels, 43mm Kayaba inverted forks, stiffer triple clamps, Die-cast swing-arm and sub-frame to name a few. I was reluctant to return the One to La Casa Del Zorro were it not for the rain growing to a steady downpour. After leaving the Mustang at Hertz’s stables I got on the line for the stage to the airport. “What magazine you write for?” came a voice from behind. Betrayed by my leathers, I turned to meet a fellow rider. Vacationing from Atlanta he told me that he was taking delivery of his new R1 as soon as he got home. I said that I’d meet him at Borrego Springs.